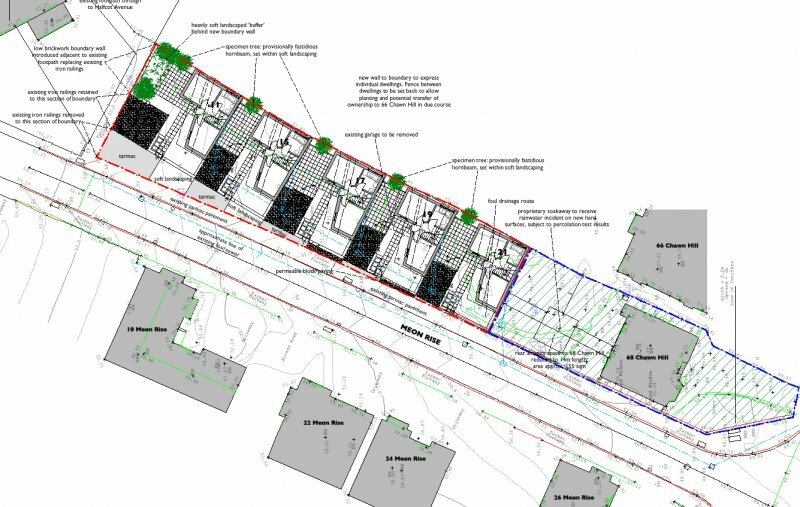 The project at Meon Rise proposed five small yet efficiently designed two bed dwellings of circa 600 sq ft set in minimal grounds accordant with the Local Development plan. 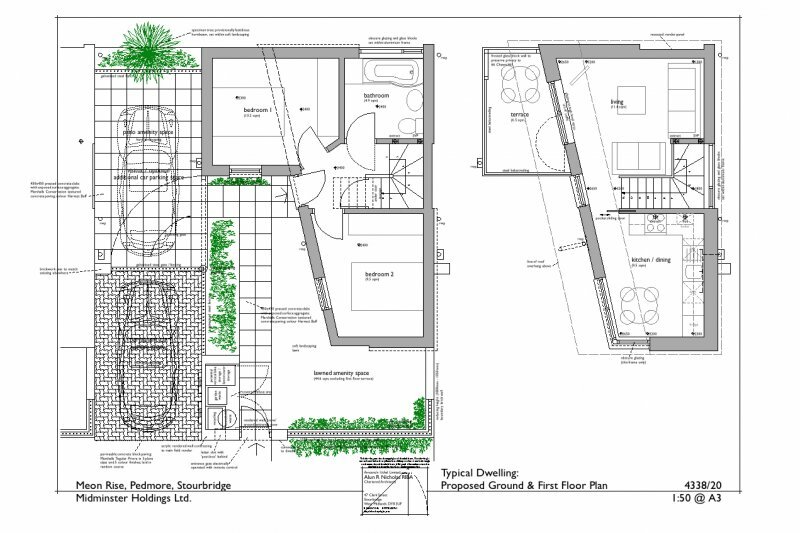 The plot was vacant land that had been part of a former public house but also incorporating a small piece of residential garden land taken from an adjacent dwelling which was also owned by our Client. No doubt historically the land was part of the rear garden to the house, but having historically been used by the public house it was in its majority previously developed land, therefore accordant in its majority with the revised PPG3. The current economic climate was a major consideration in the design of the units; reports that first time buyers were of average age 37-39 and needing to borrow some 95% of the national average annual salary as a deposit caused us to design dwellings which would have inherent affordability. The result were compact studio houses that we anticipated might only be occupied for 18 months or so be each owner: half a rung up the property ladder. In order to provide a WC at entry level without having to provide one in the bathroom upstairs as well, the bathroom was located on the ground floor, the bedrooms naturally following too. Entry was therefore into a small hall from which the two bedrooms and bathroom were accessed as was the stair leading to the open plan first floor; the stair itself separating the kitchen diner and lounge areas. From the lounge access was afforded to a small external balcony above the main bedroom which brought some of the external amenity up to the living floor. The plan of each unit was tapered to accord with the space separation criteria required, the splays meaning certain windows would look past the ends of the adjacent units and enjoy southerly aspect. The compactness of the units allowed effectively two blank walls, one to the neighbouring property’s rear garden and one to the adjacent units frontages. The balconies were beyond the requisite space separating distances from the dwellings opposite, and shielded from the adjacent property’s rear garden by an obscure glass block screen wall. The external amenity to each unit was to the side and front; a single permanent car park space with a further ‘occasional’ space beyond a single gate which when opened separated the remainder of the garden from the extended drive. A low wall with fencing over and a remotely controlled gated entrance created defensible semi-private space. An external store integrated with the entrance feature provided bin, recycling, garden equipment and cycle storage. The taper in plan created a southern facing roof onto which PV panels were planned, whilst creating a low level eaves adjacent the rear boundary to mitigate the influence on the neighbouring plot. Despite the area being of significant social and economic mix and less than 5 minutes walk to mainline station and a multitude of bus services, the project was not favoured by the Planners from the outset. Dismissive without visiting the site at pre-Application, blind to the positive aspects of the scheme at Application, it was refused on nine separate grounds. Admittedly a tight site, the scheme had been designed thoughtfully and innovately to cater for not only the physical site constraints, but also the Local Plan policies; the Planners dismissed these efforts as ‘contrived’. At Appeal, the Inspector dismissed eight of those reasons for refusal, the influence on the neighbour’s rear garden and their amenity within the house being the only reason for refusal being upheld. Buoyed by this positive response, redesign is underway and a re-Application is imminent.